We’d love your help. Let us know what’s wrong with this preview of Solemn Vows by Don Gutteridge. Now lieutenant in charge of security at Government House in Toronto, Marc Edwards is eager for action in both his personal and professional life. His letters to Beth Smallman in Crawford Corners have gone unanswered and writing speeches for Lieutenant Governor Francis Bond Head is not the stuff of excitement. Then, during an election speech by Bond Head, a shot fells a gov Now lieutenant in charge of security at Government House in Toronto, Marc Edwards is eager for action in both his personal and professional life. His letters to Beth Smallman in Crawford Corners have gone unanswered and writing speeches for Lieutenant Governor Francis Bond Head is not the stuff of excitement. Then, during an election speech by Bond Head, a shot fells a government minister sitting just behind him and Marc on the hustings. Marc’s troop gallops after an armed man who flees the scene, killing him when he points his rifle at Marc’s chest. Then they discover that the rifle has not been fired since the war of 1812. Mortified by his troop’s mistake, Marc accepts the help of Horatio Cobb, one of Toronto’s three constables in its brand new police force. He also accepts the affections of Eliza Dewart-Smythe, who is almost, but not quite, as beguiling as Beth. His investigation takes him from William Lyon Mackenzie’s newspaper office into the mansions of the Family Compact, and to the local brewery, as the clues he uncovers point closer and closer to home. To ask other readers questions about Solemn Vows, please sign up. Upper and Lower Canada are trying to unite and the protagonist is finding out that loyalty to "King and country" is only a good thing for him as long as he doesn't look too closely at where that loyalty is really leading him. Interesting but I wouldn't read it again. "It is a sweltering June day in 1836, and the people of Upper Canada are preparing for an election. When a prominent politician is shot dead on the hustings, Lieutenant Marc Edwards, eager for action, chases after an armed man he spots fleeing the scene - an armed man, but an innocent man, as Marc find out too late. Mortified by his mistake, Marc, who is now lieutenant in charge of security at Government House in Toronto, reluctantly accepts the help of th Interesting but I wouldn't read it again. Mortified by his mistake, Marc, who is now lieutenant in charge of security at Government House in Toronto, reluctantly accepts the help of the wily Horatio Cobb, one of five constables in Toronto's fledgling police force. Their joint investigation into the assassination takes Marc from William Lyon Mackenzie's newspaper office into the mansions of the Family Compact, as the clues he uncovers point closer and closer to home." Marc Edwards is a man of remarkable intelligence. After a gun marked politician is shot dead and the crime committed Marc is right on the hot trail of the shooting offender. This story is dramatic and lightly farcical with the taking up of the leading lives of several prominent characters in the Toronto area. Marc now a lieutenant of security at Government House is insecure that the clues of his crime add up to an assassination being the killers’ last and only inevitable strike. Will the gunman Marc Edwards is a man of remarkable intelligence. After a gun marked politician is shot dead and the crime committed Marc is right on the hot trail of the shooting offender. This story is dramatic and lightly farcical with the taking up of the leading lives of several prominent characters in the Toronto area. Marc now a lieutenant of security at Government House is insecure that the clues of his crime add up to an assassination being the killers’ last and only inevitable strike. Will the gunman strike a second time? 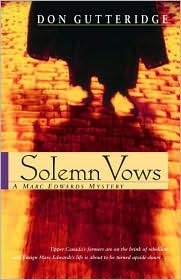 A Canadian writer Don Gutteridge, Solemn Vows is the continuation of Turncoat, A Marc Edwards Mystery, and the first book. I love this series, written by my former Faculty of Education English professor. Set in Upper Canada in the early 18th century, Don Gutteridge brings his characters and the time to life. Great historical fiction. I'm happy to hear that the fourth book in the series,Dubious Allegiance, is scheduled to come out this summer. I like the fact that these books are set in Toronto & Upper in the 1800's, but found the ending a little disappointing. It did not seem to fit the theme of the rest of the book. Far less historical details about the time period in this book compared to the first one. Good book, especially for us Torontonians as it takes place in Upper Canada, Toronto, York back in the 1800s.